Terra del Fuego which literaly means "at the end of the earth" is an and archipeligo group at the Southern tip of South America. A remote and exotic location it is Cut off from the mainland of Argentina. Postal service was somewhat limited in the 1890's, which encouraged the creation of a local service between the mining camps. Romanian born Julius Popper who owned a concession of gold mines in the area had the stamp produced to provide local service. Items that were bound for out of the area were carried to the sea via mounted couriers and then by boat to the mainland. The item then passed into either the Argentinian or Chilean postal systems. Additional postage from Argentina or Chile was then required to carry the item to it's destination. One of the most fascinating aspects of the stamp was the denomination. The price for the stamp was 10 grains of gold dust. Gold being the favorite means of tender in the area. 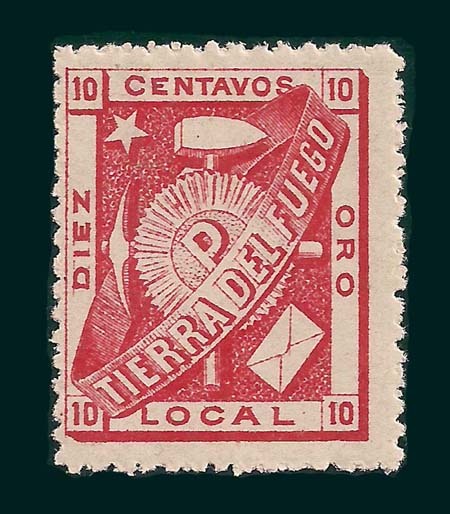 The 1891 10 oro stamp was the only stamp issued. It's length of use is vague.